Sign-ups for the upcoming Miss Raymond Pageant and Jr. Miss Raymond Pageant are now being accepted. The Miss Raymond Scholarship Program has awarded thousands of dollars in scholarship to young women in the town of Raymond who wish to pursue higher education over the past 24 years. To be eligible, you must be a resident of Raymond and currently in in grade level 9 through 12. Home school and private school high school students are also eligible. This year’s Miss Raymond Pageant will take place on Thursday July 11th as the kick off to the annual Raymond Town Fair. Scholarship money will be awarded to the newly crowned Miss Raymond and finalists. Miss Raymond traditionally is asked to make several appearances at the Town Fair and many other activities throughout the year. If you are interested in becoming a contestant please email missraymondtownfair@hotmail.com. Deadline to enter is May 22nd. The Jr. Miss Raymond Pageant will be held at 1pm on Saturday the 13th of July. To be eligible to enter you must be currently in grades 5 through 8. Scholarship money is also awarded to Jr. Miss Raymond and finalists. If interested in competing for the title of Jr. Miss Raymond 2013 please email jrmissraymond@hotmail.com Deadline to enter is May 20th. Organized by the Campaign for Tobacco-Free Kids and sponsored by United Health Foundation, Kick Butts Day is an annual celebration of youth leadership and activism in the fight against tobacco use. On Kick Butts Day, youth will encourage their peers to stay tobacco-free. They will also educate their communities about the dangers of tobacco and the tobacco industry's harmful marketing practices. * While the U.S. has greatly reduced youth smoking, 18.1 percent of high school students still smoke, and nearly 1,000 kids become regular smokers each day. Among youth smokers, 86 percent prefer Marlboro, Newport and Camel, which are the three most heavily advertised cigarette brands, according to the government's National Survey on Drug Use and Health. * Tobacco companies have also introduced new products that appeal to kids, including cheap, sweet, colorfully-packaged small cigars that look just like cigarettes. Many cigars come in fruit and candy flavors such as strawberry, vanilla, peach and apple. * In a 2012 report, the U.S. Surgeon General concluded that tobacco marketing causes kids to start and continue using tobacco products. "On Kick Butts Day, kids will stand up and reject Big Tobacco's manipulative marketing," said Matthew L. Myers, President of the Campaign for Tobacco-Free Kids. "It's also a chance for elected leaders to commit to protecting kids from tobacco through policies such as tobacco taxes, smoke-free laws and prevention programs. We hope that legislators will listen to their young constituents and implement these proven solutions to reduce tobacco use and save lives." Tobacco use is the number one cause of preventable death in the United States, killing more than 400,000 people and costing $96 billion in health care bills each year. In New Hampshire, tobacco use claims 1,700 lives and costs $564 million in health care bills each year. Currently, 18.1 percent of the state's high school students smoke. * Students at the University of New Hampshire in Durham will lead educational activities including a tobacco bingo game and a mobile display with shoes highlighting the deaths from smoking in New Hampshire each year. Location: 83 Main Street, Durham. Contact: Melissa Garvey, (603) 862-3823. * Members of Dover Youth to Youth will host activities at three schools to educate students on the dangers of tobacco use. In addition to decorating one of the schools with anti-tobacco messages and posters, the youth will give presentations entitled "the Truth About Tobacco" and "Love Your O's" to educate students on smoking's impact on lung health. Locations: Dover Middle School, 16 Daley Drive, Dover; Horne Street Elementary School, 78 Horne Street, Dover; Woodman Park Elementary School, 11 Towle Avenue, Dover. Contact: Vicki Hebert (603) 401-0735. 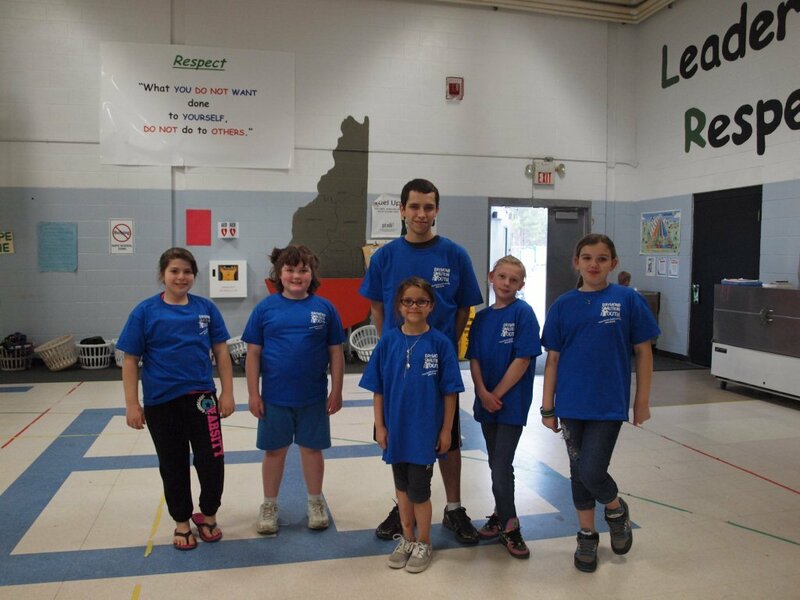 * Students and volunteers with the Breathe New Hampshire Youth Network in Manchester will arrange a "New Hampshire Soles Lost" display at the Fisher Cats baseball stadium. One thousand seven hundred pairs of shoes will be arranged throughout the stadium to showcase the people who die each year in the state from smoking. Time: 3 PM. Location: Fisher Cats Stadium, 1 Line Drive, Manchester. Contact: Claudette Knieriem (603) 785-1174. * Youth from the Raymond Coalition for Youth will conduct a flash mob with colorful, elaborate signs at the Iber Holmes Gove Middle School during period changes throughout the day. Location: 1 Stephen Batchelder Parkway, Raymond. Contact: Steven Michelson (603) 895-4735 x137. Boy Scout Troop 3 of Raymond recently joined the Pease Greeters in welcoming home a group of approximately 40 soldiers who had been deployed to Iraq. They had been in Iraq assisting the government with infrastructure projects. With the slogan of "Thanking Our Troops, One Flight at a Time ", the Pease Greeters is a non-profit organization dedicated to giving a warm welcome to military units traveling through Pease International Airport on either return flights or being deployed overseas. Volunteers are always welcome and more information and schedules can be found at www.peasegreeters.org. Troop 3 was honored to be participants with the 525th flight ceremony of the Pease Greeters. Following the ceremony the Troop toured the USS Albacore, a submarine museum ship in Portsmouth. Boy Scout Troop 3 meets Wednesday evenings at 7:00 PM the Congregational Church of Raymond (Raymond town common near town gazebo). 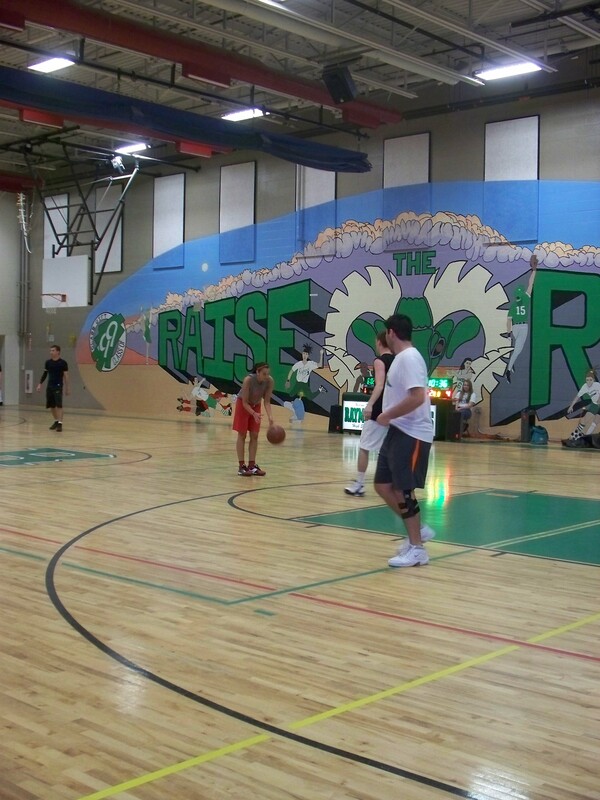 We welcome guests and potential new members, boys ages 11 to 17 or finished the 5th grade. The troop is currently planning a 9-day trip for next summer to Pennsylvania, Virginia and West Virginia. For more information contact Scoutmaster Jon McCosh at 603-895-1108. Winnacunnet High School in Hampton, NH will be hosting their first ever “VEX Seacoast Winter Classic” Robotics competition this Saturday, January 19, 2013. With over 50 teams registered to compete from NH and Massachusetts, it promises to be a fast moving and exciting event. Winnacunnet Engineering teams have consistently ranked well at each of the VEX competitions, and received awards for specific technical achievements. Winnacunnet has four teams that compete in the competitions. At their last event, WHS Team 4558A received the “Tournament Champions” award, which qualifies them for the U.S. National VEX Robotics Championship High School Division to be held March 2013. Dylan Cox, Francesca Bolton, and Tanner Quinn. Competition will begin at 9 am and conclude with the awards ceremony at 4 pm. This is a free event and the public is encouraged to attend. Come for an hour, or stay the whole day! Concession stand available and a raffle table with a chance to win great items. For more information on the Winnacunnet Engineering program, please email Mr. James Muthig, (Engineering Team Advisor) Math and Technology teacher at jmuthig@winnacunnet.org, or visit the WHS Engineering Web site at www.whsrobotics.tk. While the hockey players finished up their time on the ice, the girls in the Ice Skating Club of Exeter (I.C.E. ), waited anxiously to begin their Holiday on Ice Skating Exhibition on Saturday, Dec. 29. A total of 29 skaters, ages ranging from 7 to 18, all performed solos to holiday music. The Rinks at Exeter are known as the coldest rinks around; the girls wore jackets and blankets trying to keep warm before they performed. Once they were up to do their solo, adrenaline kicked in and the cold was no longer a factor. I.C.E. 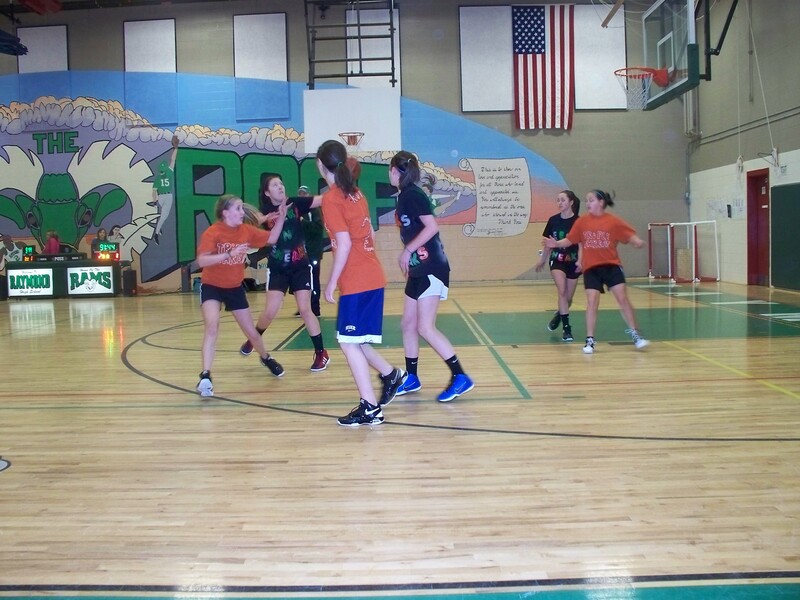 girls practice four to five days a week and an hour or two a day. They spent two and a half months preparing for the Holiday on Ice Skating Exhibition. Natalie Saxton, 17, from Brentwood skated to “The Nutcracker.” She started skating when she was 4 years old. Natalie said she started ice skating because “I couldn’t kick a soccer ball and liked the dresses.” Her 13 years of experience skating helped her remain calm when her music did not play. After fixing the technical issue, Natalie took the ice with nothing but confidence. Her elegance on the ice was a sure sign that this girl had a natural talent. Next year Natalie will be attending Holy Cross College. Holy Cross does not have a figure skating program but she will continue skating on her own. One of the five coaches, Carol Sturtevant, has been coaching for 30 years. Her daughter Ali, 21, was home from Northeastern University, where she attends college and is the president of its Figure Skating Club. Ali has been skating for 19 years and helps choreograph programs for the I.C.E girls when she is home from school. Before she started college, Ali was skating alongside the I.C.E. girls. Ali is friends with Victoria Baker, 18, of Raymond, who still skates with I.C.E. She looks at Victoria with nothing but pride on her face. Victoria has been asked to audition for Disney on Ice at the end of January. After submitting a video of her skating, Disney asked her to come do an in-person audition. Victoria closed the show with a performance to Christmas Eve in Sarajevo. The girls frequently travel to Lake Placid and Vermont to compete. Gilly Cole, 14, from Portsmouth remembers her first time going to Lake Placid, when she skated with Miracle on Ice, where the 1980 Winter Olympics took place. Judy Maynard, of Raymond, has been the President of I.C.E. for the past two years. Her daughter, Sara Cleasby, 9, has been skating with I.C.E. for two years and daughter Michaela Maynard, 16, has been with I.C.E. for 8 years. Judy helped promote the Holiday on Ice Skating Exhibition by creating the programs, making signs and fliers for the show, hoping to get the word out and expose the talent hidden at the Rinks of Exeter. While some of the girls are getting ready to start the next chapter in their skating career, whether it be professionally or at the collegiate level, other members of I.C.E are just starting their career. The three youngest skaters, Kyra Lachance on ice, 7, and Aubrey Ayres and Jaidyn Rancourt, both 8, were all smiles and nervous to perform their first solos, but enjoy the music and wearing the fancy outfits. Martha McDonough, of Brentwood, and Roddy Cole, of Portsmouth, ran the raffle that benefits the figure skating club by subsidizing the team jackets and helps pay for both practice and show ice time. With the Holiday on Ice show complete, the girls move on to choreographing and practicing for their biggest I.C.E show in June, which includes the Learn-To-Skate program members. At 8 am Saturday, Nov. 10, over a dozen vehicles driven by parents of local Boy Scouts and Girl Scouts motored up and down all the roads in Raymond, gathering bags attached to mailboxes or on sitting on the ground, filled with donated items for the Annual Scouting for Food drive. When the doors were opened, the shelves of the Rockingham Food Pantry were essentially bare and it was clear this food drive was seriously needed to help those in our community. Some of the canned and boxed goods found on the shelves were expired and removed. Scouts Matt Lopez, Joe Lopez and David Mayl were eager to get started because the bags were coming in steadily. The bags and boxes were piled outside the doors for the scouts to sort through and place on the shelves in categories of fruit, vegetables, cereal, juices, rice, pasta, soups, canned tuna and chicken, sauces and gravies, paper towels and plates, diapers, soaps, shampoos, toothpaste, and other personal toiletries as well as the Helping Hands boxes from Hannaford. Rick Arnold said one of the areas in town that really contributed the best was the Englewood Mobile Home Park on Harriman Hill Road. By the end of the day the shelves were filled and the Food Pantry was ready to handle any and all requests for assistance from local needy families. Unfortunately, a table in the back room was stacked with a portion of the products collected that had already expired and could not be placed on the shelves, including some items that had been opened. Youth in Rockingham County 4-H joined millions of young people across the nation to become scientists for the day during the fifth annual 4-H National Youth Science Day (NYSD) on Wednesday, Oct. 10. The annual event seeks to spark an early youth interest in science and future science careers, and to reclaim the nation's position of leadership in scientific exploration. As part of 4-H NYSD, youth participated in the 4-H Eco-Bot Challenge, the 2012 National Science Experiment. Participating youth enhanced their engineering skills by assembling their own Eco-Bots and surface controls to manage an environmental clean-up. Youth tested the interaction between the Eco-Bot's design features and various surface control configurations and determined the most effective clean-up solution for the simulated spill. Courtesy photo: 4-H National Youth Science Experiment participants Sam Drake of Nottingham, Nora Hickey of North Hampton, and Nora's father, Seth, inspect the design of their Eco-Bot at a recent event held at the UNH Cooperative Extension office in Brentwood. "Participation in high quality positive youth development programs like 4-H NYSD offers youth and adults the opportunity to engage in scientific exploration and work together to build the next generation of our nation's scientists, engineers and mathematicians. Plus, the experiments are really cool," said Joe Drake, Rockingham County 4-H Program Coordinator. As part of the Cooperative Extension System of the United States Department of Agriculture, 4-H has been educating youth in the sciences for more than 100 years. In Rockingham County, more than 1,000 4-H members and 200 adult volunteers and student interns are involved in 4-H through local clubs, afterschool programs, state, and national events. For more information, contact the UNH Cooperative Extension office at (603) 679-5616 or visit the web site at bit.ly/RockCty4H. Boy Scout Troop 3 will be selling Trails End Popcorn at the Ace Hardware / Ben Franklin store in Raymond on Saturday October 20th and Sunday October 21st from 9:00AM to 3:00PM. The troop is raising money for a July 2013 trip to Gettysburg, Pennsylvania for the 150 anniversary month of the famous battle. Boy Scout Troop 3 meets Wednesday evenings at 7:00 PM the Congregational Church of Raymond (Raymond town common near town gazebo). The troop welcomes guests and potential new members, boys ages 11 to 17 or finished the 5th grade. The troop is currently planning a 9-day trip for next summer to Pennsylvania , Virginia and West Virginia . For more information contact Scoutmaster Jon McCosh at 603-895-1108. Boy Scout Troop 3 of Raymond had exhibits at this year’s Deerfield Fair in the Grange and Agricultural Building. The primary display focused on the troop’s outdoor program. Troop 3 goes camping every month of the year. In 2011 the troop hiked the Lincoln Woods Trail, Lost River Caves, Rockingham Recreational Trail and Mount Waternomee. In 2012 the troop hiked the Dilly Cliff Trail, Gordon Pond Trail, Kinsman Ridge Trail and Mount Moosilauke. Troop 3’s Senior Patrol Leader, Anthony Dickerson, entered a Boy Scout themed scarecrow made of vegetables in the scarecrow contest, with signage depicting the points of the Scout Law. Both displays won 2nd Place ribbons. Boy Scout Troop 3 meets Wednesday evenings at 7:00 PM the Congregational Church of Raymond (Raymond town common near town gazebo). 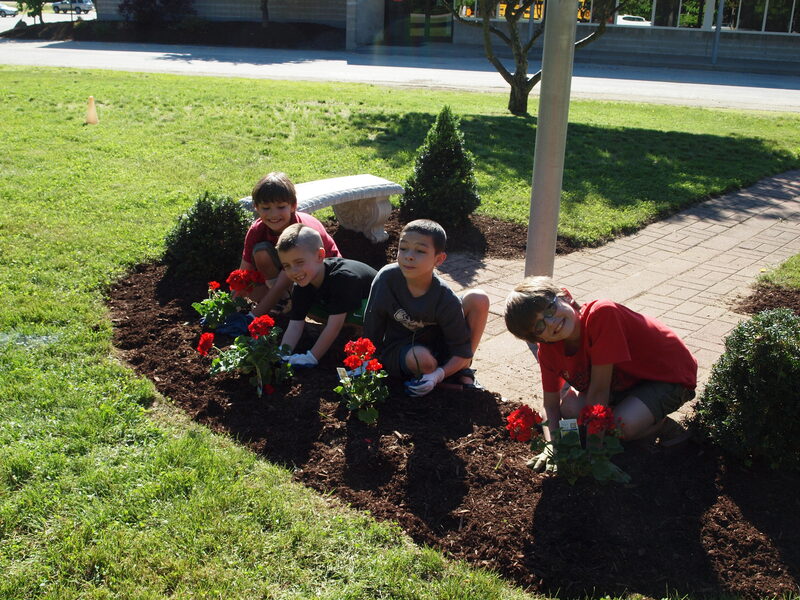 We welcome guests and potential new members, boys ages 11 to 17 or finished the 5th grade. The troop is currently planning a 9-day trip for next summer to Pennsylvania, Virginia and West Virginia. For more information contact Scoutmaster Jon McCosh at 603-895-1108. Boy Scout Troop 3 of Raymond participated in New Hampshire’s “Flags on the 48” commemoration of September 11th. Every year on the Saturday closest to September 11, flags are simultaneously raised on all 48 of New Hampshire’s 4000-foot high mountains. This year Raymond’s Troop 3 was with the contingent that climbed Mount Moosilauke in North Woodstock, on Saturday September 8th. Boy Scout Troop 3 meets on Wednesday nights at 7:00PM, at the Congregational Church of Raymond and is for boys ages 11 to 17. The troop runs an active outdoor program that includes monthly camping trips, mountain climbs, hikes, canoe trips and kayak trips. For more information contact Scoutmaster Jon McCosh at 603-895-1108. Troop 3 atop Mount Moosilauke – pictured left to right – Joshua Ryan, J.J. McCosh, Thomas Huguet, Anthony Dickerson, Assistant Scoutmaster John Bizios. (Photo by Brian Miville). Magic show at Massabesic Audubon Center’s Camp Wildside- By Angie Krysiak. The campers at Massabesic Audubon Center’s Camp Wildside were treated to a magic show by BJ Hickman, sponsored by Waste Management. BJ’s show discussed recycling, reusing, and reducing our impact on the earth in keeping with the camp’s ‘Keepers of the Earth’ theme this week. BJ entertains family audiences with comedy magic, dazzling deceptions, and mind reading miracles. His audience participation magic shows are a popular favorite throughout New England. The campers were delighted and amazed, and the Massabesic Audubon Center is grateful to Waste Management for allowing them to have this ‘magical’ experience. Thursday evening is the 2012 Miss Raymond Pageant at 7pm at the Raymond High School. All contestants must be in high school or a 2012 high school graduate enrolled in college. They are competing for twelve hundred dollars of scholarship funds that will be divided between the contestants. First place receives $500, second $300, third place $200 and fourth place $100. There is also the Betty O’Donnell Memorial Scholarship Award of $100 for academic community service. The four contestants for Miss Raymond this year are: Sagemarie George, was a Raymond student until 8th grade, she will be a senior at Phillips Exeter Academy and will perform a clarinet solo; Madison Douzanis, a junior at RHS will present an original poetic reading; Taylor Brewitt a sophomore at RHS will perform an aerial dance and Emily Vadeboncoeur also a sophomore at RHS will perform a lyrical dance. There are five phases of competition that each contestant must be judged on: a ten minute private interview , an on-stage random question to display their ability for quick concise thinking, the Casual Attire competition, the Talent competition and last is the Evening Attire competition. On Saturday, the 6th annual Jr. Miss Raymond Pageant will also be held at Raymond High School beginning at 2pm. They are competing for eight hundred dollars of scholarship funds. The contestants for Jr. Miss Raymond are: Brittney Champoux, Amanda Clivio, Savannah Cooney, Madison DiPietro, Tovah Duffaut, Morgan Godding, Autumn Hogan, Kayla Hogan, Sydni Kissane, Alyssa Sylvia, Mariah Vettesse and Grace Woolson. Tickets are available at the door, adults are $8.00, students and seniors are $6.00, children under 6 are free! Program hosts are Lauren Campbell and Kaitlyn Edwards, Miss Raymond 2009. The Miss/ Jr. Miss Scholarship Program would like to thank our sponsors for making this program possible. Sponsors of this event include Ultimate Bouquet, The Crayon Campus, Lamprey Family Dental, Judy Williams Real Estate, Radio Grove Hardware, White Rock Farm, Atkinson Cleaning Service, Cashmere Bouquet, Gordos Burritos, Sweatshirts Etc., Finnigan Family 2011 Jr Miss Raymond, Graham Chiropractic, Beneficial Bodyworks, Atomic Real Estate, Alpha Locksmith, Kountry Hair Design and Brewitt Funeral Services. Riders from the Raymond Silver Saddles advancing to the State Show after placing in the the 4-H County Horse Show at the Deerfield Fair Grounds on Saturday June 23rd and Sunday June 24th. Left to right: Kelsey Escobar, Jackie Johnson, Maggie Kenter, Cameron Waites, Ava Corrente, Karissa Martin, Hannah Proulx and Diane Post in front. For the stable managers, Alexis Latter (from Plaistow) can advance to the State Show. My Girl Tara Memorial Trophy Hannah Proulx-Hannah retired this trophy as she has won it 3 years in a row! The club was awarded blue ribbons for Stable management. The annual Raymond Town Fair is about to begin! This year’s fair starts on Friday July 13th, and will go until Sunday the 15th. The 2012 Miss Raymond Pageant will be held on Thursday July 12th at 7pm at Raymond High School. Each year the Miss/Jr. Miss Raymond Scholarship program awards $2,000.00 in scholarship money to the newly crowned titleholders and finalists. On Saturday, the 6th annual Jr. Miss Raymond Pageant will also be held at Raymond High School beginning at 2pm. 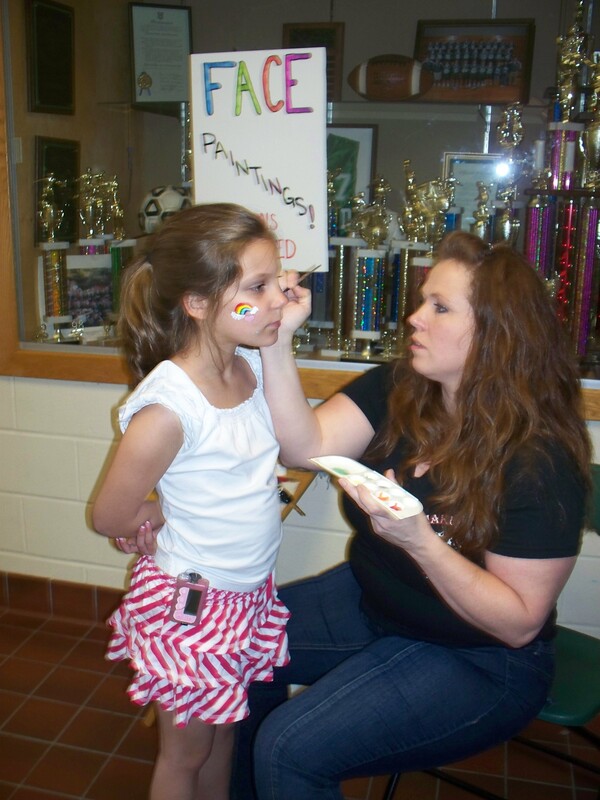 Both pageants are an annual event that many people young and old look forward to each year. After the new titleholders are crowned they will begin their new duties by making their first appearance at the fair on Friday and Saturday night. They will also be participating in numerous events throughout the rest of the weekend. Tickets for the pageants are $8.00 for adults and $6.00 for students and seniors. Children under 6 get in free! Please come out and support our four wonderful Miss Raymond contestants, and our 13 fabulous Jr. Miss Raymond contestants! I’m sure they will be anxiously waiting to see who captures the crowns! For more info on the Miss and Jr. Miss Raymond Pageants please contact the Raymond Recreation Department or email the directors at missraymondtownfair@hotmail.com. BRENTWOOD - A group of youth involved with 4-H in Rockingham County recently took first place in the eCybermission Science, Technology, Engineering, and Mathematics (STEM) challenge sponsored by the U.S. Army. Team MakeTheBestBetter, made up of eighth graders Tiffany King, Rachel Laughner, Michael Liebfried, and Katrina Vogel each received a check for $500 for their "Where Is Your Recycling Bin?" experiment conducted in local schools. 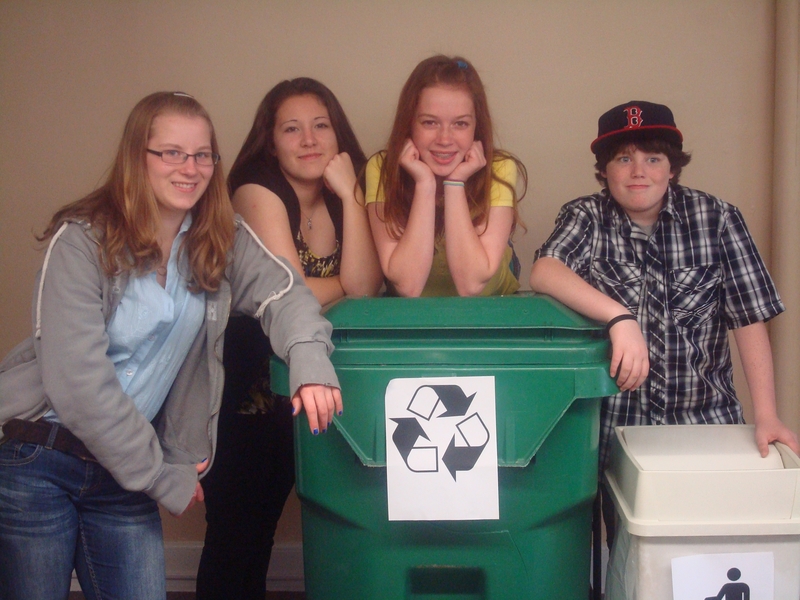 The team studied the impact on recycling use related to the location of bins. All results were submitted and judged online through eCybermission.com. Team MakeTheBestBetter, sponsored by 4-H Rockingham County, was the 8th Grade First Place NH state winner for the eCybermission competition. Pictured from left are Tiffany King of Epping, Rachel Laughner and Katarina Vogel of Raymond, and Michael Liebfried of Brentwood. Not shown is the Team Adviser Doug Vogel. For more information about eCybermission or 4-H in Rockhingham County, contact Rick Alleva at 679-5616 or rick.alleva@unh.edu. 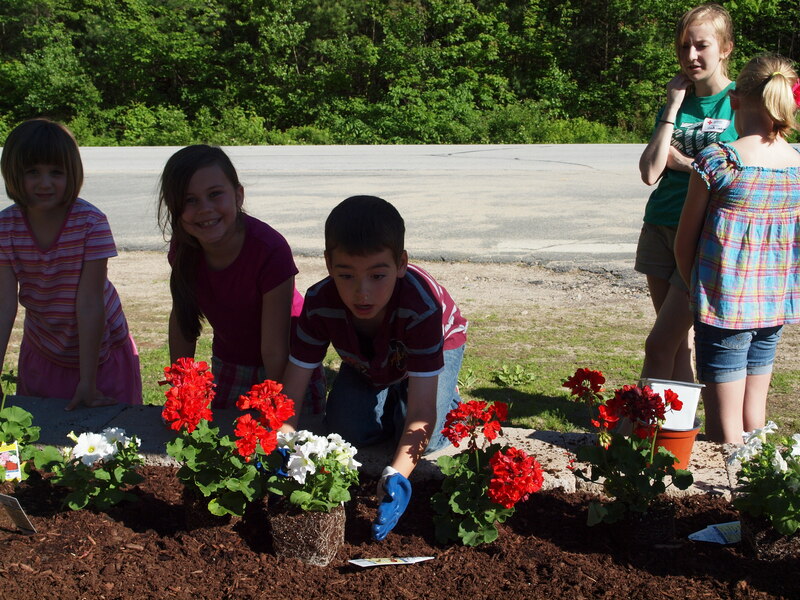 4-H is the youth development program of the UNH Cooperative Extension. Through participating in 4-H, youth experience a sense of belonging, learn important life skills, have a voice in shaping their future, and make a positive difference in the world. In Rockingham County, more than 1,000 4-H members and 200 adult volunteers and student interns are involved in 4-H through local clubs, afterschool programs, state, and national events. 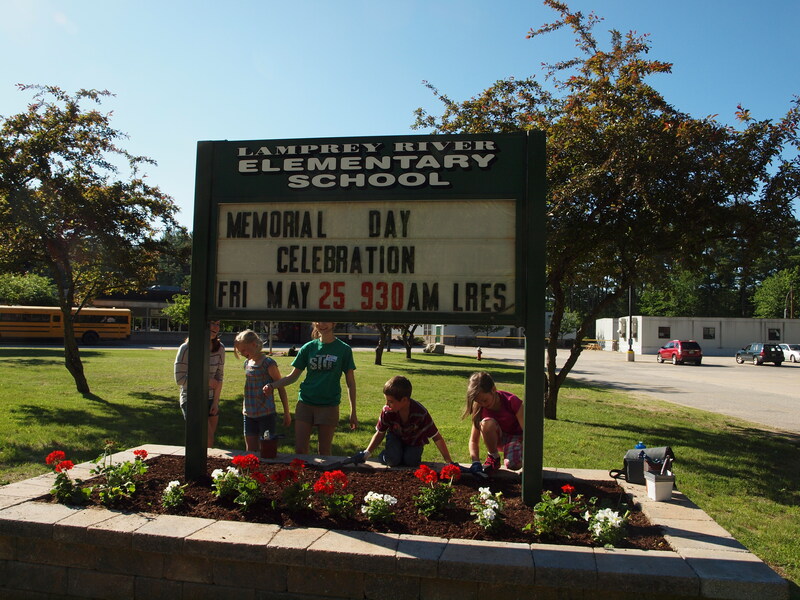 Lamprey River Elementary School students planted flowers for Memorial Day. 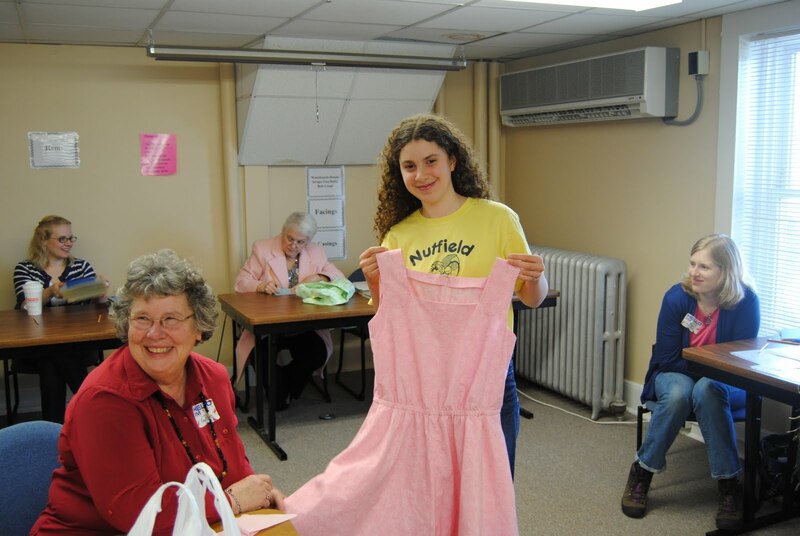 Sewing machines and sergers throughout the seacoast have been humming as 4-H youth in Rockingham and Strafford Counties created garments for themselves and others in the 4-H Clothing and Textiles project area. Members also became better consumers, shopping for their wardrobes, and looking for quality and price in the Fashion Selections project area. 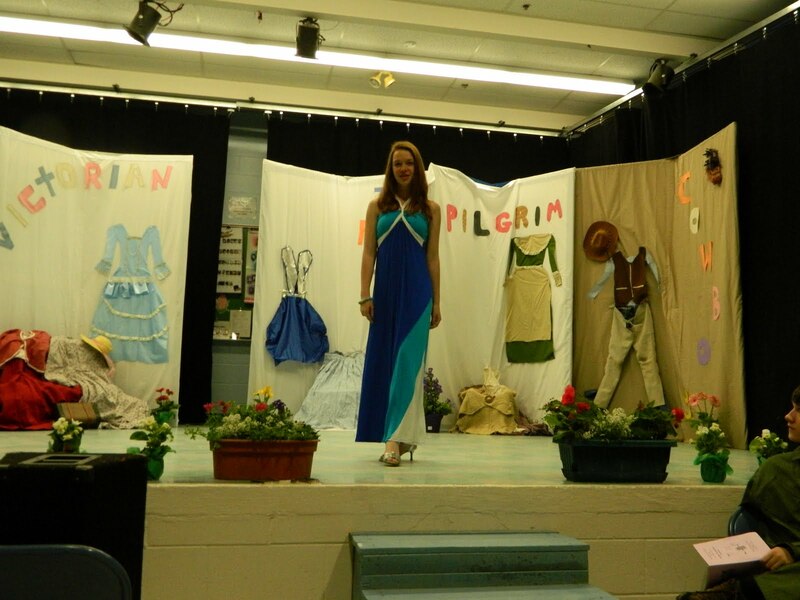 Finished projects that were sewn by youth between the ages of 5 to 18, and the fashion selection were showcased in this year's "Fashion Through The Centuries" 4-H Fashion Revue held on May 4 at the Epping Elementary School. Showcasing the sewing projects were: Anna Haber, 14, Raymond, sundress; Elizabeth Caverly, 14, East Hampstead, dress; Rachel Laughner, 14, Raymond, dress, Morgan King, 17, and Colleen McCormack, 17, both of Epping, also modeled their sewn dresses in the fashion show at Riverside Nursing Home in Dover. Anna Haber of Raymond displays the dress she made to 4-H Fashion Revue judge Lynn Garland, Extension Educator Emeritus. Katarina Vogel of Raymond models the dress she chose for her Fashion Selections project at the 4-H Fashion Show at the Riverside Nursing Home in Dover. 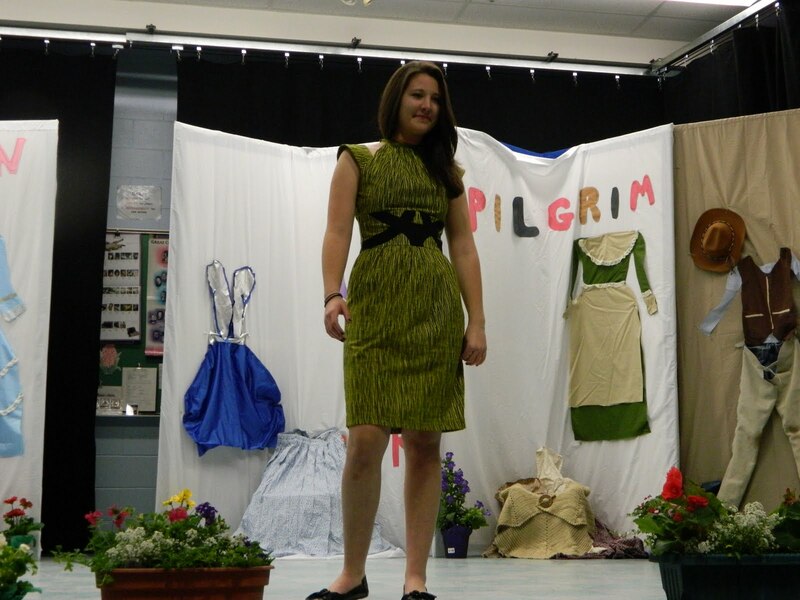 Rachel Laughner of Raymond models the dress she created for 4-H Fashion Revue. The construction and overall appearance of the sewn items were evaluated, and youth received helpful hints for future sewing projects from the judges panel of: Sally Barney, Lee; Catherine Dill, Northwood; Alberta Eckert, Portsmouth; Suzanne Kasprzak, Barrington; Bryn Munroe, Dover; Jessica Rhodes and Lucy Rhodes, Auburn; Brandie Rice, Fremont ; Lynn Garland and Jenny Hutchins, Deerfield. Modeling their Fashion Selections consumer projects were: Rachel Laughner, 14, Raymond, jeans and a shirt; Alex Ojemann, 17, Sandown, dress; Elizabeth Caverly, 14, East Hampstead, dress; Caryn Ojemann, 15, Sandown, dress and blazer; Katarina Vogel, 14, Raymond, long dress; and Reba-lyn Liebfried, 15, Brentwood, rain coat. In the Fashion Selections program youth must describe their goals for the purchase, describe the overall construction, fabric, labeling and care of the garment and analyze the shopping experience. Prior to the show, youth participated in "Making the Most of Me" workshops with Catherine Dill and Brandie Rice teaching modeling and stage presence; hair styling by Louann Wilson, Nottingham; skin care and make up by Evone Lawrence, Nottingham, and Cacia King, Epping; nail care by Christine LaMore, Newmarket. 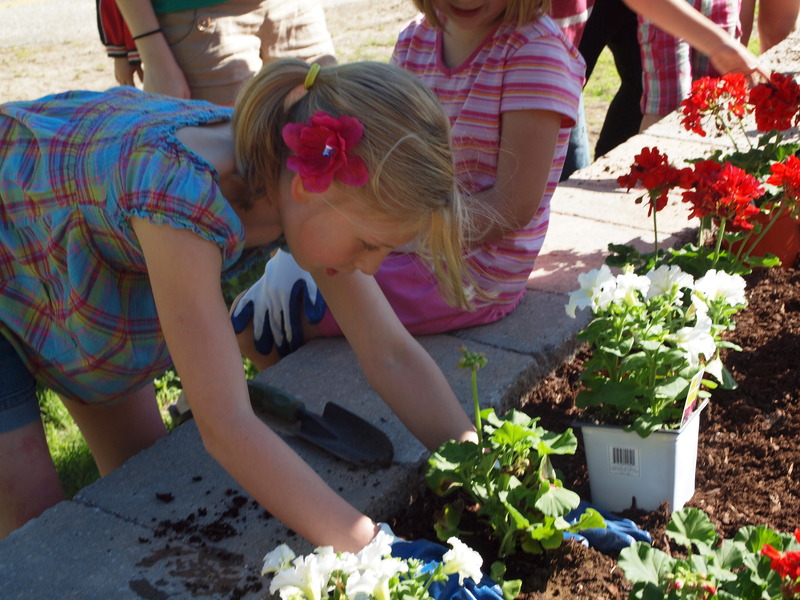 4-H is the youth development program of the UNH Cooperative Extension. Through participating in 4-H, youth experience a sense of belonging, learn important life skills, have a voice in shaping their future, and make a positive difference in the world. In Rockingham County, more than 1,000 4-H members and 200 adult volunteers and student interns are involved in 4-H through local clubs, afterschool programs, state, and national events. For more information, contact the Rockingham County 4-H office at (603) 679-5616 or visit the web site at bit.ly/RockCty4H. 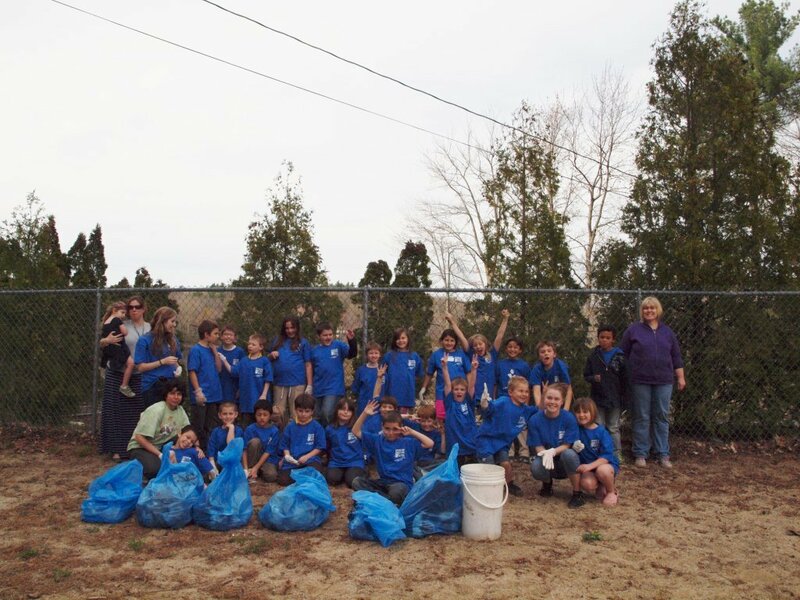 On Earth Day April 18, the Lamprey River Elementary School students participated in Project Raymond Cleanup by picking up trash, cans, bottles and cigarette butts up and down the streets of downtown Raymond. Great Job and THANK YOU!! 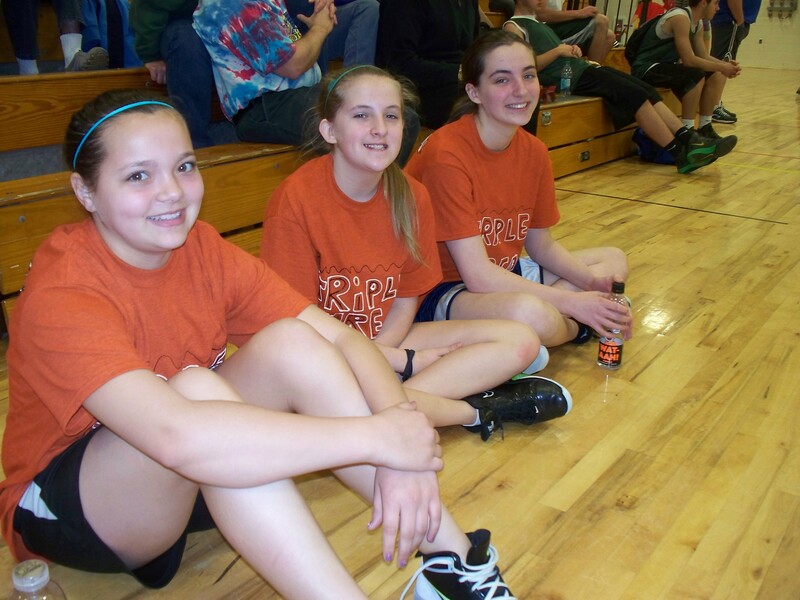 The Town of Raymond came together to support one of its own families by holding a 3 v 3 basketball tournament. Recently, a single mother in town was diagnosed with a rare form of cancer. This mother of three has always volunteered for different programs in town and is a prime example of why Raymond has such a tremendous range of offerings to keep people active and involved with the community over a broad range of age groups. 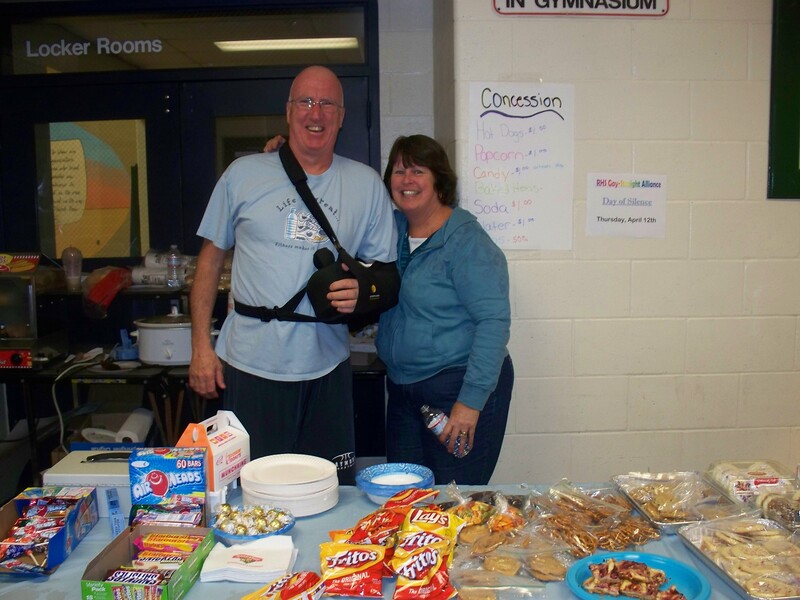 The event was held at Raymond High School on Saturday, March 24, and raised $1,700.00 for the family. The tournament was a double elimination style event and consisted of several age groups with many participants who all donated an entrance fee to participate. There was also multiple raffles and 50/50 tickets sold to bolster the fund raising effort. Of course the competition was fierce, but all kept in mind the reason they were there. We would like to thank all those that participated and/or volunteered their time to make this event a success. We had so many businesses and community members that donated various items, just to name a few: Autotrader, Tiffany Lawrence of Picture This Photography, Kountry Hair Design, Claire & Gerry’s Car Care, Telly’s, Tonya Thompson of Water Country, Raymond Recreation, Don Lorinovich, Reflections, Stacy & Nic Hedstrom of Hedstrong Design, Bob’s Tees, Miller Family, Bernadette Corneau, Kim Schilleref, and the Lehman Family. If you would like to contribute to help support the Cameron Family, please contact the Raymond Recreation Department at 895-4735 or People’s United Bank in Raymond. 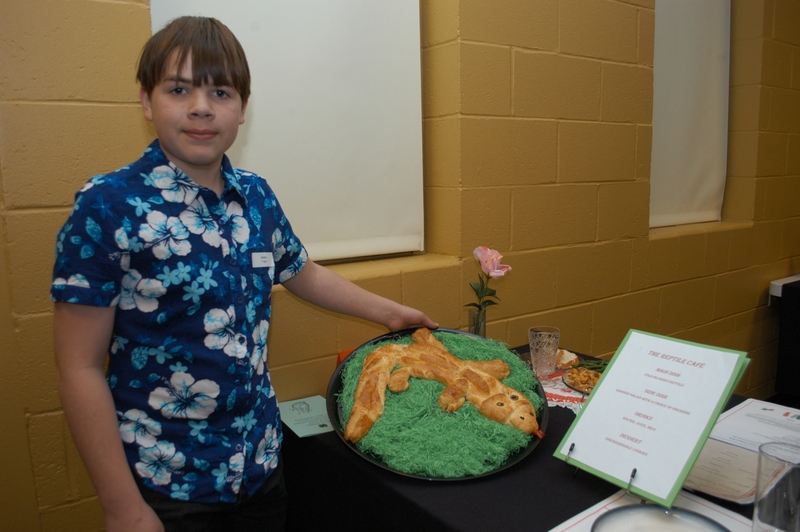 EXETER - More than 50 local young chefs displayed their culinary talents at the recent 4-H Favorite Foods Festival held at the Seacoast School of Technology in Exeter. The annual festival is the showcase event in the 4-H foods, nutrition, and healthy lifestyles project area. 4-H youth choose and prepare a favorite food, plan a balanced menu, and attractively present their recipe with a table setting for the menu planned. Additionally, they research questions relating to food, nutrition, health, consumer food shopping, and food and kitchen safety. Read more.
. Participants mentioned in article are from Brentwood, Candia, Danville, East Hampstead, Epping, Exeter, Hampton, Newmarket, North Hampton, Raymond, Stratham, and Methuen, MA. James Vogel of Raymond displays selections created for his "Reptile Café" at the 4-H Favorite Foods Festival. 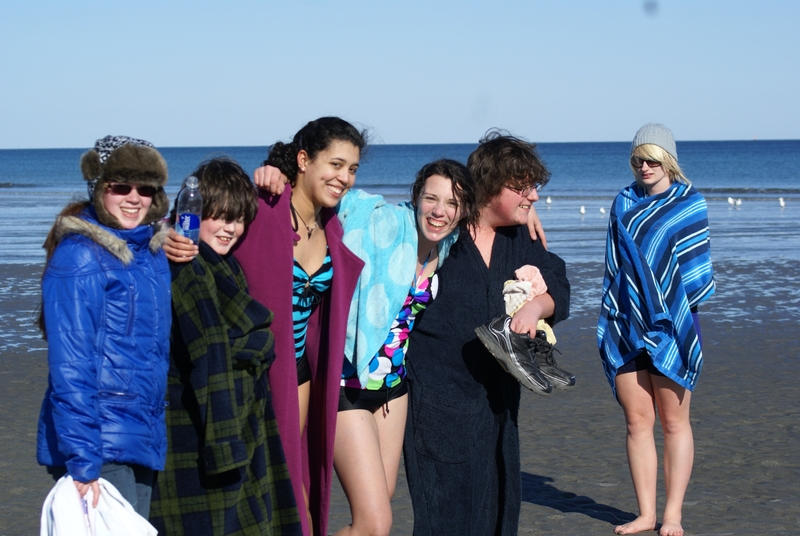 The Rockingham County 4-H Next Step Teen Club warms up and celebrates after their Polar Plunge Fundraiser in Rye on Feb. 19. The group has been in contact with Dominica youth and Peace Corp volunteers and is planning a service learning trip next year. Funds raised through the Polar Plunge will help finance their trip. The club is welcoming additional teens, both 4-H members and non-members, ages 14 and up, who are interested in service work and leadership development. For more information, contact UNH Cooperative Extension's Rockingham County 4-H office at (603) 679-5616. Club members are, from left, Anya Vogel of Raymond, Michael Liebfried, Jordan Roberts, and Reba Liebfried of Brentwood, James Turner of Derry, and Chelsea Stockdale of Raymond. BRENTWOOD - The Rockingham County Horse Leaders Association celebrated the achievements of its participants at their annual banquet on January 14. 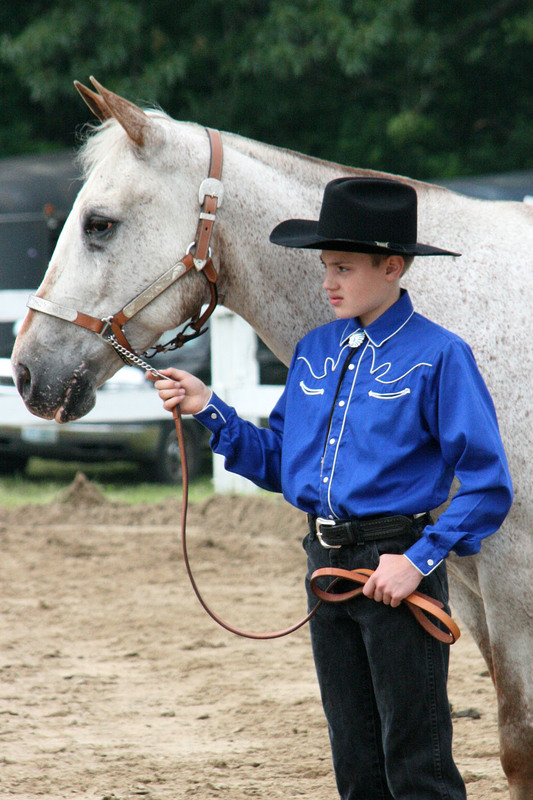 Rockingham County runs three horse shows annually as part of a show circuit. These shows are open to 4-H members and non-members alike. The evening's awards began with the walk-trot division. The top overall high point went to Rosalie Toupin of Dracut, Mass., and her horse A Grand Slam Player. Toupin also took home the Overall Highest Quiz Trophy donated by S&S Glass Design. In the Senior Hunt Seat Division, Hannah Proulx of Raymond and her horse Ima Jettin Passem won the Tali Tivora Trophy for Overall High Point Senior. Alexandra Ojemann of Sandown and her horse Sunny Delight won the King Crimson Memorial Trophy for High Point English Pleasure. The Lo Rabbi Kazak Memorial Trophy for High Point Junior or Senior Western was won by Kelsey Escobar of Kingston, and her horse Pekoe. Top Overall High Point Junior or Senior went to Hannah Proulx of Raymond and her horse Ima Jettin Passé. Reserve Overall High Point Junior or Senior went to Kelsey Escobar of Kingston and her horse Pekoe. The award for Good Sportsmanship throughout the year was given to Maggie Kenter of Kingston. The Leaders Choice Award, honoring a non-riding member for leadership, cooperation, sportsmanship, and helpfulness throughout the year was given to Peppermint Ponies 4-H Club member Kiara Jutras of Raymond. The Raymond Silver Saddles, with leader Diane Post of Raymond, was awarded The Bear Meadow Farm, Karen Morton Memorial Trophy for the 4-H club with outstanding representation and active membership throughout the year in 4-H activities. Cody Gleason of Danville and his horse Gamble at the June 2011 Circuit Horse show, one of three circuit shows run by Rockingham County 4-H clubs last year.